Peter Powell presents The Piranhas, Toyah, The Kids from Fame, Imagination, Kool and the Gang, Bauhaus, Spandau Ballet, Culture Club, Sharon Redd and Shakin' Stevens. Browse content similar to 21/10/1982. Check below for episodes and series from the same categories and more! Hello, welcome to another edition of Top Of The Pops. We got Toyah, we got Bauhaus, we got Kool And The Gang. And we got a new number one. But for openers, it's The Piranhas and Zambezi! for The Piranhas and Zambezi. At number three it's The Kids From Fame. a short while ago, which she recorded. and a brand-new single as well. It's called Be Proud, Be Loud. # Can you hear these words? # Can you hear the word? for Toyah - Be Proud, Be Loud. And wearing that amazing technicolour dream coat of hers. Let's Go Dancing (Ooh, La, La), this is Kool & The Gang. # They said, JT, don't ya feel good, man? # Hey, baby, what's your name? # Is it Mrs or is it Miss? It's called (Ooh, La, La) Let's Go Dancing. Bauhaus have done a tribute to the alter ego of David Bowie. It's called Ziggy Stardust. # While the fly tried to break our balls? # So we bitched about his fans and should we crush his sweet hands? Brilliant. Bauhaus. OK, let's go to the charts. Let's go to the charts, this week's 30. At 30, I Don't Wanna Dance from Eddy Grant. At 29, Take A Chance With Me from Roxy Music. At 28, Life In Tokyo from Japan. At 27, Never Give You Up from Sharon Redd. At 26, Love's Coming At Ya, Melba Moore. At 25, Glittering Prize from Simple Minds. At 24, In The Heat Of The Night, Imagination. At 23, Why? from Carly Simon. At 22, Back On The Chain Gang from The Pretenders. And at 21, Friend Or Foe, it's Adam Ant. At 20, I'll Be Satisfied from Shakin' Stevens. At 19, There It Is, from Shalamar. At 18, Ziggy Stardust from Bauhaus. At 17, Should I Stay Or Should I Go? The Clash. At 16, Mad World, Tears For Fears. At 15, Love Come Down from Evelyn King. At 14, Just What I Always Wanted, from Mari Wilson. At 13, I Wanna Do It With You, Barry Manilow. At 12, Reap The Wild Wind from Ultravox. And at 11, House Of The Rising Sun, The Animals. in the north-west over the next couple of nights, Shakin' Stevens. # That's all I need! Shaky making one young fan very happy indeed, and I'll Be Satisfied. At ten, Jackie Wilson Said from Dexy's. At nine, Annie, I'm Not Your Daddy from Kid Creole and The Coconuts. At eight, Danger Games, from the Pinkees. At seven, Lifeline from Spandau Ballet. At six, Hard To Say I'm Sorry from Chicago. At five, Love Me Do, The Beatles. At four, Zoom, Fat Larry's Band. At three, Starmaker, Kids From Fame. At two, Pass The Dutchie from Musical Youth. And at one, a brand-new number one, it's Do You Really Want To Hurt Me? # How can I be real? # Do you really want to hurt me? # Do you really want to make me cry? to a number one with Do You Really Want To Hurt Me? on the crew the other side, as well. Join us next week for another edition of Top Of The Pops. We play out with Annie, I'm Not Your Daddy. This is Kid Creole & The Coconuts. Peter Powell presents the weekly pop chart show, first broadcast on 21 December 1982. 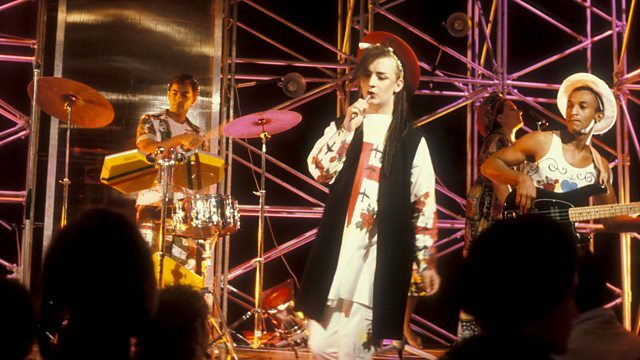 Includes appearances from The Piranhas, Toyah, The Kids from Fame, Imagination, Kool and the Gang, Bauhaus, Spandau Ballet, Culture Club, Sharon Redd and Shakin' Stevens.